In the meantime, T-Mobile is doubling down on Android. These days, 75 percent of all devices sold by T-Mobile are smartphones, he said. And 90 percent of those phones are powered by Android. Brodman also used the event to introduce a number of new devices powered by the company’s 42Mbps network. Brodman also used the event to introduce a number of new devices powered by the company’s 42Mbps network. 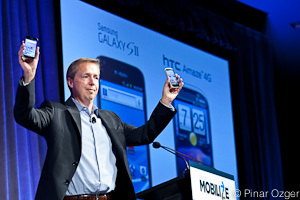 He showed off the the Samsung Galaxy S II and the HTC Amaze 4G, the carrier’s first 42 Mbps smartphones. The two devices represent the first phones to make use of T-Mobile’s recent 42Mbps network upgrade (read all about the technical specs of the phones as well as the also-introduced Sonic 4G Mobile Hotspot here). Video chat, Netflix (s NFLX) and other mobile video platforms are fueling the demand for 4G, explained Brodman. He said that 4G devices now make up for about 15 percent of the ten million smartphone devices the company now has in the marketplace, but they already cause around half of the company’s data traffic. And half of the 4G data traffic is caused by video. Om Malik also quizzed Brodman about the troubled merger plans with AT&T. T-Mobile’s merger with AT&T is currently in limbo after the Department of Justice filed a lawsuit against it in late August, but Brodman tried to convey optimism: “We still expect it to happen,” he said, but admitted that there is a possibility it won’t go through. “Our customers win either way,” he said, pointing to T-Mobile’s infrastructure updates, as if to say: At least you won;t have to share them with those AT&T customers. Brodman should be fired as the worst CMO in the history of mankind. it’s cause T-Mobile will be bought out sooner or later. AT&T runs GSM networks in US. Why would I give you my iphone usage when I can make real money on Sprint, AT&T and Verizon? Haven’t you heard? ATT isn’t acquiring TMo because one of their people effed up the deal. In a world where technology is moving forward at break-neck speeds, the iPhone would be a step backwards for T-mobile.